A new study says nearly 2 million workers with taxpayer-supported jobs make $12 per hour or less. Starting at 7:30 this morning, hundreds of non-union workers with taxpayer-supported jobs plan to go on strike in the nation’s capitol. Organizers expect the one-day walkout to include workers employed at Smithsonian museums, the Old Post Office and Ronald Reagan buildings and Union Station, where tourists, lobbyists and members of Congress arrive by Amtrak train to Washington, DC. The strikers are part of a recently-unveiled organization, Good Jobs Nation, backed by labor and community groups. They’re demanding that President Obama take action to improve wages and working conditions for workers employed under federal contracts. “The truth is, I’m ready. I’m not scared,” janitor Vilma Martinez told The Nation in Spanish last night. “Fear fades away, especially in the face of the unfair treatment we get here.” Martinez, who’s worked at Union Station for the past nineteen years, said that the federal contractor ICC Cleaning pays her $8.75 an hour. She said she’s supposed to get regular check-ups for a serious heart condition, but only sees a doctor when she goes back to El Salvador, because she’s uninsured. Traub and Hiltonsmith’s tally includes jobs funded or supported through direct federal contracts (560,000 jobs), Medicare or federal Medicaid spending (1,184,000 jobs), Small Business Administration loans, federal Child Health Insurance Program (CHIP) spending, federal infrastructure funds or Public Buildings Service property leases. “This is more than the number of low-wage workers at Walmart and McDonalds combined,” write Traub and Hiltonsmith. At the other end of the pay scale, they note, the executives who employ these workers can legally be reimbursed by taxpayers for total compensation of up to $763,029 per year. The Office of Management and Budget did not respond to a request for comment on the study late Monday afternoon. Good Jobs Nation is backed by organizations including the community organizing group OUR DC, the clergy group Samuel DeWitt Proctor Conference and the labor federation Change to Win. As The Nation has reported, Change to Win affiliates have also provided support for recent strikes by non-union workers worked employed in Walmart stores, in sub-contracted Walmart warehouses, on sub-contracted cleaning crews in Twin Cities Target stores and in fast food restaurants in five cities. 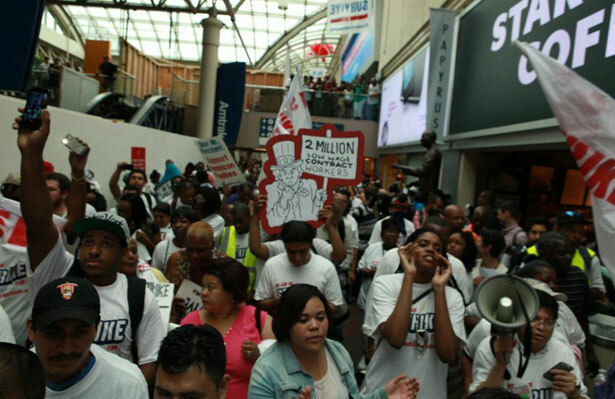 Strikers will converge for rallies at Union Station at 12:30 and 4:30 this afternoon. Members of Congress, including House Democratic Whip Steny Hoyer and Congressional Progressive Caucus Chairs Keith Ellison and Raul Grijalva, are expected to host an “ad hoc hearing” at 3 pm regarding taxpayer-backed low-wage employment. In September 2010, the Government Accountability Office issued a report concluding that the government had paid $6 billion in fiscal year 2009 federal contracts to contractors who had been cited for violations of federal labor laws. Seven months earlier, The New York Times reported that the Obama administration was planning to issue a “High Road Procurement Policy” that could “disqualify more companies with labor, environmental or other violations and give an edge to companies that offer better levels of pay, health coverage, pensions and other benefits” in securing federal contracts. But such a move never came to pass; the following year, Obama OMB appointee Heather Higginbottom said in her confirmation hearing that it was not currently under consideration (an administration official told Government Executive afterwards that OMB was “considering the views of Congress, the private sector, and others with respect to possible initiatives and no decision has been made”). Labor and LGBT activists have also called for the administration to use executive action to bar federal contractors from discriminating against LGBT workers; Obama so far has not done so. Update (1:15 PM Tuesday): According to the Good Jobs Nation campaign, hundreds of workers are now on strike, forcing the shutdown of "about half" of the Reagan's building's food court outlets, and of the McDonald's located at the Air and Space Museum. In an e-mailed statement, one of that store's employees, Ana Salvador, said, "The company I work for makes big profits thanks to taxpayers. It's not right that I work hard every day to serve the public, and I have to choose between taking the Metro to work and paying the electric bill." The federal Office of Management and Budget did not immediately respond to a Tuesday morning request for comment on the strikes. Last week, teachers voted to keep the Caucus of Rank-and-File Educators at the helm of the Chicago Teachers Union. Read Micah Uetricht’s report.